The report is very interesting and gives good insight into what UX design looks like right now as an industry and how it’s changing. The thing I keep thinking about, thought, is a section called Technology. Each year new technology is highlighted as technology that will be prominent to UX and the overall future of tech. We covered many of the past technologies in ENP-162, including artificial intelligence, chatbots, the internet of things, and augmented reality. 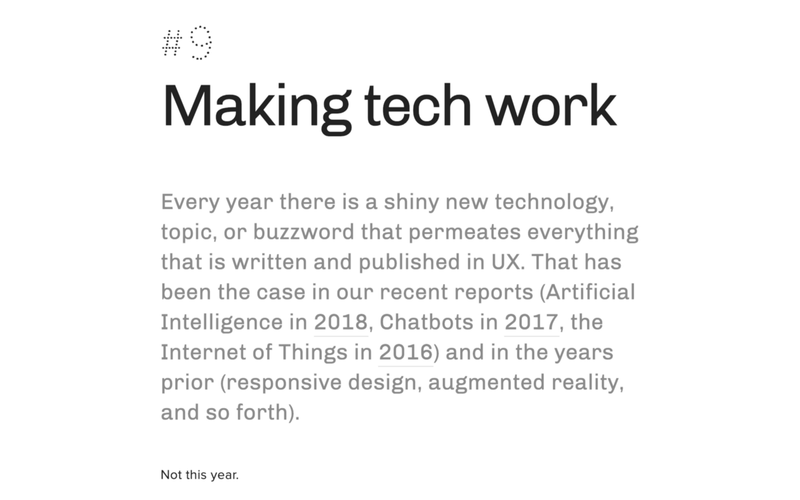 But this year, for 2019, there is no technology. I thought this was really interesting and a little peculiar because there’s always something happening. The authors go on to speculate that it might be because there hasn’t been a game changer technology created this year, or we’ve been focusing on other things but the real reason, they say, is that as designers and technologists we have not mastered the existing technology yet. I think this paragraph stuck with me so much because we’ve touched all these technologies in class. We’ve talked about future humans and fully automated kitchens, but it’s also important to keep perspective and remember while all this is shiny and new, it’s still very inconsistent and untested and we still have a long way to go.